Compared to most other desserts, cheesecake is probably the lesser evil given that it does contain some protein. However, I certainly don’t advocate that people with diabetes eat a lot of cheesecake. But I had a bunch of ripe SoCal Avocados and I was asked to bring a dessert to a dinner party, so I decided to be unconventional and make avocado cheesecake. Six people tried the cheesecake. Everyone mostly liked it. Four people gave it an unconditional thumbs-up, one person saying that the addition of some chili powder would have been amazing. The other two people liked it, but each had reservations. One person said she wasn’t a fan of sweetness and avocado in the same dish. The other said he was a huge fan of key lime cheesecake which this physically resembled, so when he bit into the avocado cheesecake, he was expecting lime flavor and was disappointed he didn’t get it. Fair enough. Some liked the vanilla tomatoes and others preferred their cheesecake plain. 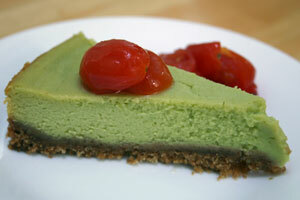 The tomatoes are very good spooned atop raw avocado as well if you want to skip the cheesecake entirely. Try this and let me know what you think. Just be sure to make it the day before you want to serve it. Preheat oven to 300°F. Combine graham cracker crumbs and butter in medium bowl. Mix well. Spray bottom and sides of a 9-inch springform pan with cooking spray. Press crumb mixture evenly on bottom of pan only. Bake for 5 minutes to set crust, then cool to room temperature. In a small saucepan, combine sugar, water and vanilla bean over medium-low heat. Cook, stirring occasionally, until sugar has melted, then add tomatoes. Simmer 10-15 minutes until tomatoes soften, but still retain their shape. Remove tomatoes from the pan with a slotted spoon and place in a glass jar. Increase heat to medium-high and reduce liquid by half (it will take about 10 minutes). Pour liquid over tomatoes, cool slightly, then refrigerate until ready to serve. Preheat oven to 300°F. Whip cream cheese with an electric mixture until smooth, about 3 minutes. Add avocado, sugar and vanilla and blend until smooth. Add eggs one at a time (or egg substitute 1/4 cup at a time), blending well after each addition. Strain through a fine mesh strainer, then add the lemon zest. Place pan containing (cooled) crust on a baking sheet, then pour avocado mixture into crust. Bake for 45 minutes or until set. Cool to room temperature, then refrigerate. When you’re ready to serve, top each slice with drained Vanilla Tomatoes. Nutritional Analysis: Nutritional information was calculated using eggs, not egg substitute. If you are watching cholesterol and fat, use egg substitute instead. You might also want to try substituting olive oil for the butter in the crust. First time to your site! This cheese cake is intriguing, I think I may try to make it soon. I love avocado’s too so thinking it should taste amazing! have a great weekend! Wow. That’s it. Just wow. So creative! I love it, so creative! Those tomatoes sound amazing too!